It was a warm summer’s day, Christmas time 2012, to be more precise, and because the year-old air-conditioning had broken down, we had left open the sliding-door to air and cool the bedroom during the early evening: one needs to sleep, right? Later, when we retired, our caring cat set up camp in the bedroom too. Such loyalty… she enjoyed our company, even when we slept. For weeks we had delighted in the sweet serenade of a frog: our first frog in our new home. On sunset ‘he’ would begin his song - more of a laugh than a song - and continue until the early hours of the morning. 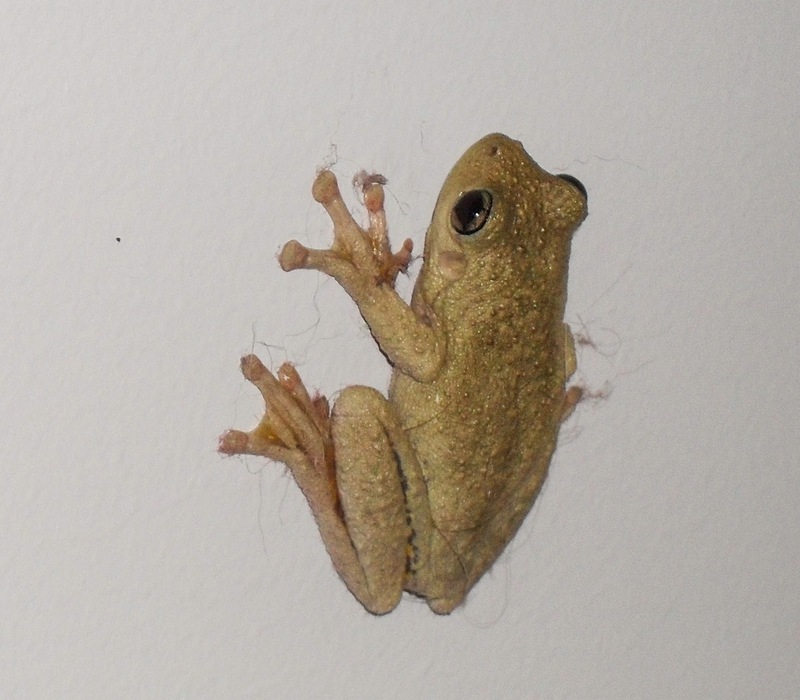 Wasn’t it lovely to have a resident frog in a suburban Western Sydney home? Our small pond of comets and shubunkins was the possible attraction for the frog, who, from a small, intermittently-flowing creek, had hop-hop-hopped his way across a quiet street and up a hill, passing two other homes before deciding that our home provided his vital requirements. Thus, all the conditions were right for disorder! And disorder did eventuate! It was four in the morning, the time of deepest sleep. However, we were both woken by the laugh-singing of the frog. It sounded so unusually close! It could even have been in the room! Then the slumbering cat went crazy. It was racing around the room and leaping up walls. Racing and leaping and leaping and racing! There was screeching and squealing. The cat was screeching! The frog was squealing! The cat was screeching in anger chasing the frog. The frog was bounding from wall to floor and back again, squealing with fear, trying to evade a very persistent pursuer… trying to avoid becoming a ‘midnight snack’. The frog was indeed in the room! I grabbed our ‘placid’ pet, shutting her outside the bedroom in the main part of the house. At the same time I allowed the hapless frog time to regain its composure before putting it outside in its true garden home… Morning peace reigned again over our sleeping neighbourhood. Our first frog lived for some more months happily in our garden. ‘He’ had made his home among our zygocactus plants on a plant stand, right outside our bedroom door. Then one unfortunate day I discovered 'him' dead in our fish pond. I am not an expert on frogs and amphibians, and I am happy to be corrected on this claim. I suspect our frog to have been a Tyler’s Tree Frog (Litoria tyleri). The photo in this post was taken on the night the cat went crazy… Please note the strands of carpet adhering to the frog’s sticky pads. We have never been blessed by a visit from a Tyler’s Tree Frog since his passing. And the placid animal no longer has access to the bedroom!